What does Rhizosphaera needle cast look like? 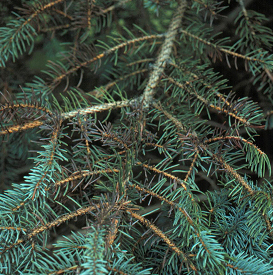 The first noticeable symptom of Rhizosphaera needle cast is a browning and loss of the innermost needles on the lower branches of spruce trees. Often the youngest needles at the tips of branches remain healthy. Rows of small, black spheres form along the length of infected needles and are visible with a 10X hand lens. These black spheres are fruiting bodies (i.e., reproductive structures) of the fungus that auses the disease and are diagnostic. Where does Rhizosphaera needle cast come from? Rhizosphaera needle cast is caused by the fungus Rhizosphaera kalkhoffii. Infected needles, including those that are still attached to branches and those that have fallen to the ground, produce spores that can be blown or splashed to healthy branches or trees. For more information on Rhizosphaera needle cast: See UW-Extension Bulletin A2640, “Colorado Blue Spruce and Other Conifers Disorder: Rhizosphaera Needle Cast” (available at https://learningstore.uwex.edu/) or contact your county Extension agent.